Dahlias will grow almost anywhere and in almost any soil but to have really good plants you must be selective of the planting location. They relish a free draining soil and sunshine to thrive and should receive at least a half-day of sun and even more is preferable. Chose a position in full sun but avoid areas where plants will be exposed to damaging cold winds. The tubers can be started by first planting 2 -3 in deep in pots in March approx 6 weeks before you transplant them outside. A temperature of around 60 degF is ideal to encourage them into growth. The soil should be slightly damp, but not wet, as they can rot or develop poorly when conditions are too wet. Place them in good light and spray them occasionally with water to encourage the buds to form well. Plants should be about 12” tall or less when you move them outdoors. If the plants are over 12” high, pinch them back before transplanting them. 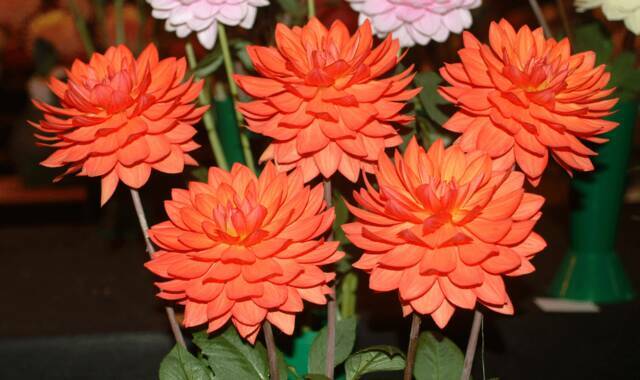 After transplanting your dahlias into your beds, be sure to keep them watered until the roots are established. 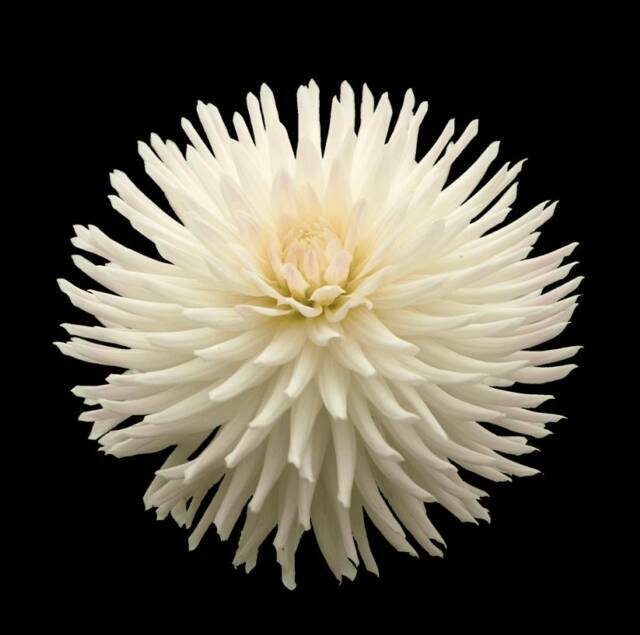 Once your dahlias are established, care for your dahlias as you would with tubers planted directly in the ground. Do not plant out if the soil is very wet, as this may encourage rotting of the tuber but wait until a dry spell is forecast. 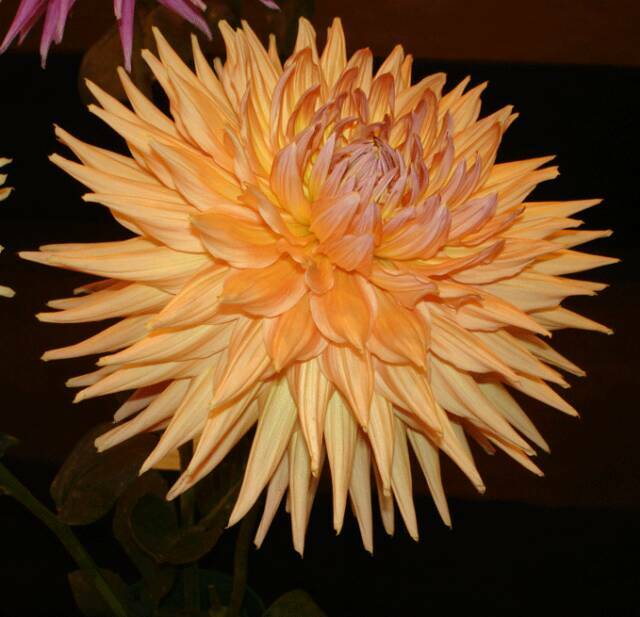 The dahlia tuber is unlike many other bulbs in that it wants to be planted in warm well drained soils, in mid April/May time. Spring should be well on its way with the longer and warmer days and all danger of frost has passed. Dig and prepare a hole 12 inch diameter and 12 inches deep. Mix a shovel full of compost, a handful of bone meal and a little ground limestone to the soil which has been removed. Fill the planting hole with the soil mixture until it is 6 inches deep, then place the tuber horizontally in the bottom of the hole with the eye pointing upwards. Do not water the tubers after planting as the soil has enough moisture to promote proper growth until they have been in the ground 3-4 weeks to allow the roots to start to look for water. Cover the tubers with about 2 inches of the mixture when the sprout begins to emerge from the soil, gradually add more mixture. 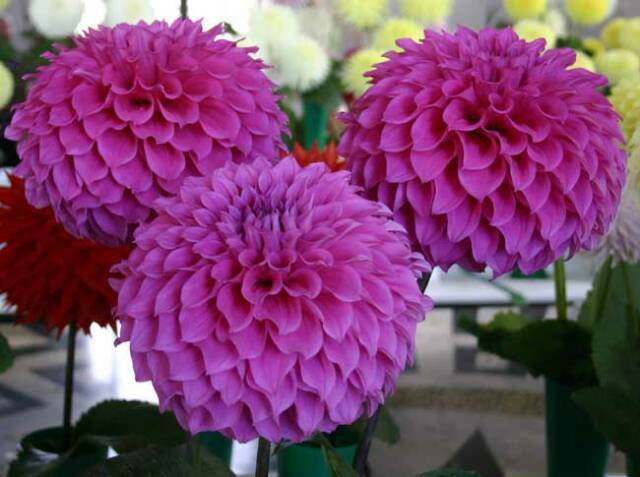 Good soil drainage is vital for dahlia plants. If the soil holds surface water for more than several hours after a rain, the likelihood is that it should be augmented with organic matter in the autumn. Don’t over-water the tuber at the time of planting as this may encourage the whole tuber to rot. Once the plant begins to grow begin watering every few days throughout the summer months. Water dahlias at the root level were the plant needs it, with a good soaking which is far better than passing a spray on the plants for a short period. Since they don’t send down a tap root or long feeder roots the plants will easily be blown over by the wind, so tall varieties need staking. Do this as the time of planting - not later when you may damage the tuber by running a stake through it; this is also a good time to name the variety. When the plants get to be a foot tall, be sure to begin tying them to the stakes. Tights do the job very well as they will expand with the plant rather than cutting into it. So the flowers don’t lose impact if the stems flop forward under the weight of the flowers you will need to continue to tie them to the stake every 18 to 24 inches. When plants are about a foot tall and display 3 to 4 pairs of leaves, they should be "stopped" by pinching out the growing tip to encourage branching... Mid June or early July is the time to stop, leaving it too late will mean that the plants will flower later. If too many stems are produced, then carefully select the strongest stems and remove all the weak ones (laterals). At the end of each branch there will normally be three buds. If a plant is not disbudded, all the buds will develop. In most cases only the central one is left to flower with the other two being carefully rubbed out. 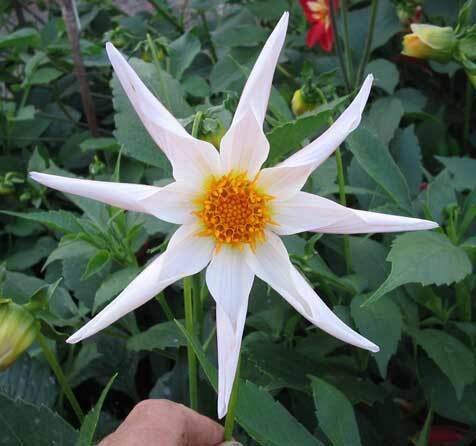 To promote a compact, bushy growing habit, with more flowers, pinch back the growing tip when your dahlia is about a foot high. Instead of disbudding, allow plants to grow with all shoots intact. As each terminal bud develops, flowers and fades, remove it to allow the side buds to develop and flower. Continue removing old flowers throughout the season. If your goal is to produce massive blooms, on long stems remove all of the side buds at the end of each branch leaving only the one single centre bud. This will force the plant to concentrate all its energy into the remaining crown bud. The number of growths retained or removed will influence the ultimate size of blooms. One of the biggest mistakes made with dahlias is over-feeding them. 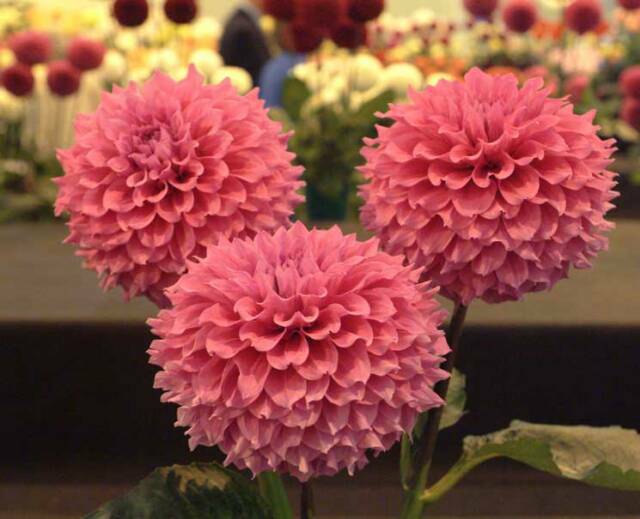 Dahlias require a low nitrogen fertilizer, such as used for vegetables. 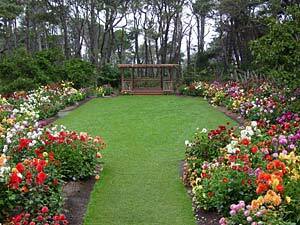 They generally recommend high percentage potassium and phosphorus fertilizers such as a 5-10-10, 10-20-20, or 0-20-20. First applications should be within 30 days of planting and repeated again approx. 3-4 weeks later. 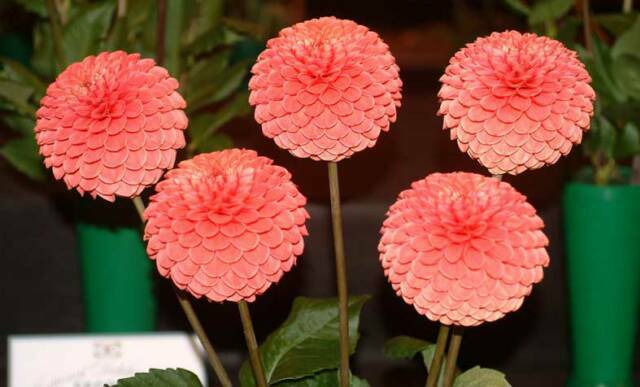 A dahlia in bloom is a very heavy feeder, so you may like to give it a high potash feed such as fish blood and bone towards the end of mid-summer, as the flower buds are starting to form. Avoid high nitrogen water soluble types as they promote weak stems, small blooms, or no blooms, and tubers that rot or shrivel in storage. Best time to cut your flowers is in the cool mornings. Place the cut stems in 2-3” of VERY HOT WATER (approx. 160-180 degrees) and allow to cool for at least one hour. This will set your blooms and make your flowers last for 4-6 days. Removing old blooms will keep your plants strong and blooming late into the season. It is recommended the tuberous roots be lifted and stored during the winter. The storage of dahlia tubers prior to planting is critical. Store in a cool, dry area (temp. of 40-50 degrees) in crates or cardboard boxes, line the containers with 10-12 sheets of newspaper. Start with your packing medium in the bottom and layer tubers until the container is full. Tubers should be never store in sealed plastic bags or plastic containers. They must not be allowed to freeze where they will rot or become too warm as they will wrinkle/shrivel. 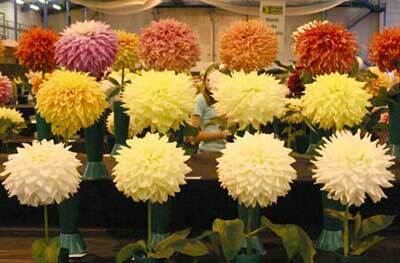 Continue to check your dahlia tubers weekly for rot or mould. 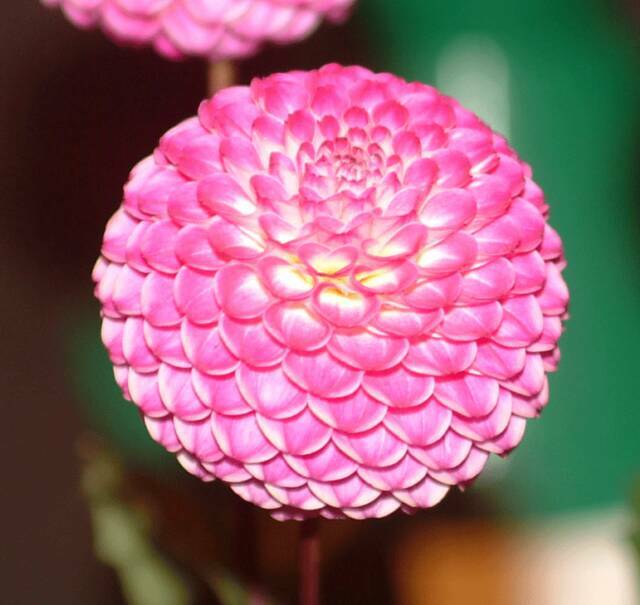 As you handle the dahlia tubers be careful not to damage the growing point known as an ‘eye’.